A trip to the park with Daddy is full of joyful opportunities to climb, to jump, to swing, to be lifted . . . Up! Once again, award-winning poet Kristine O’Connell George takes a playful look at the world through the eyes of a very young child. 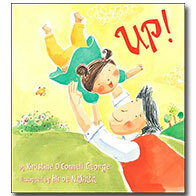 With a theme every parent and toddler will recognize, her brief stanzas, accompanied by Hiroe Nakata’s bright watercolor paintings, p erfectly capture the thrill and exuberance of being "Up!" Isn't Hiroe Nakata's art magical? Look for the whimsical surprises she's hidden on almost every page! "[A] joyful, sun-soaked picture book which celebrates a father-daughter day in the park. In minimal, rhyming words that bounce with an irresistible beat...George conveys a vivid sense of a toddler's eye-view — from the "flying feeling" ... to the thrill of swinging high. Nakata's airy, spirited watercolors beautifully expand on the words' carefree physical elation with skewed angles, glorious fruit-juice colors, and leaping, tumbling toys and figures. Children will easily recognize the toddler's irrepressible energy, and they will feel the girl's gleeful empowerment when she flies high, as well as her deep trust and comfort when Dad's there to catch, "safe and snug - tucked inside ...daddy's hug." Trinity, age four, our very first reader!